This Saturday I’ll be teaching my German Tellerbarret Make-and-Take Class at RUM (Royal University of the Midrealm) from 11-1 pm. This year, Royal University of the Midrealm is located at Cleveland Central Catholic High School and St. Stanislaus Church Social Hall, 6550 Baxter Ave., Cleveland, OH 44105 — there is a $12 entry fee ($17 for non-members). 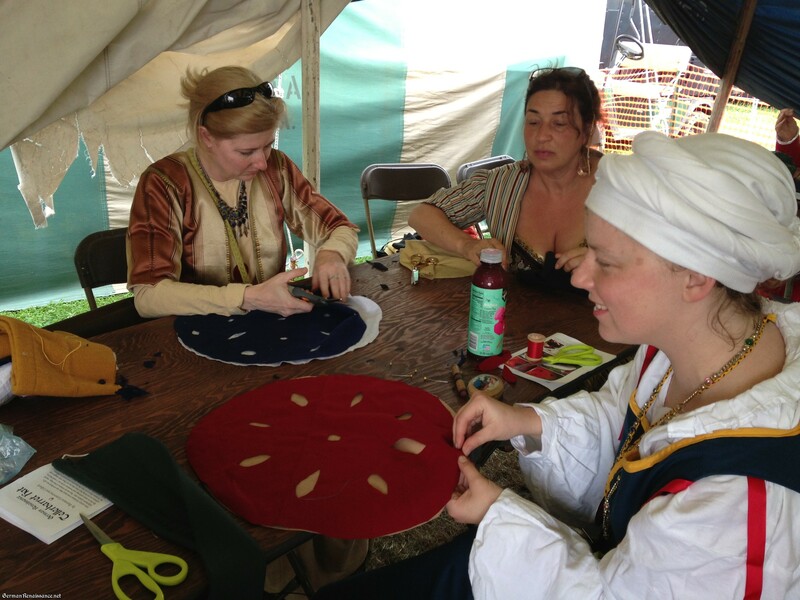 If you’re not an SCA member or otherwise familiar with the SCA, this event is open to the public — we just ask that all participants make an attempt at pre-17th century clothing. There are more than 100 classes this Saturday, all are free and some have low-cost material fees. It’s a wonderful opportunity to learn something new! 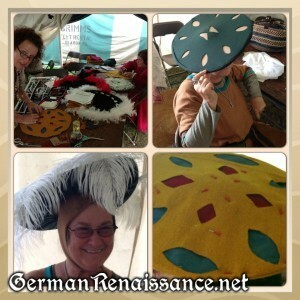 A hands-on German hat-making experience! Students will view several examples of different *Tellerbarret* hat styles and constructions, then be instructed in creating their own hat — complete with slashing, if desired. No experience is necessary. Students will cut, slash, and sew their own hats. These hats work great for keeping your face shaded at outdoor events! Please bring your own scissors. Handout limit: 30. Materials limit: 5 ($10) or BYO materials: 36″x55″ (one yard) of wool + 24″x24″ (2 sq. ft.) of wool or linen in contrasting color. For those interested in taking my class this weekend, please know that this class was very popular at Pennsic, much to my surprise. 20 or more people showed up, even though I only had materials for 5. 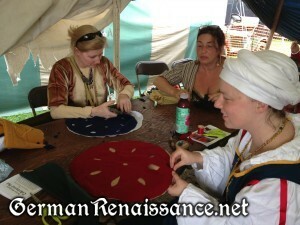 Three people actually ran out to the marketplace and bought wool on the spot so they could take the class. I don’t know if it will also be so popular at RUM, but if this class is important to you, I urge you to bring your own wool — then you do not have to worry about not having what you need. Remember you need 36″x55″ (one yard) of wool + 24″x24″ (2 sq. ft.) of wool or linen in contrasting color. There are other things you can bring so you don’t have to share with others, such as a measuring tape, needle, and thread. And don’t forget your fabric scissors! 1. 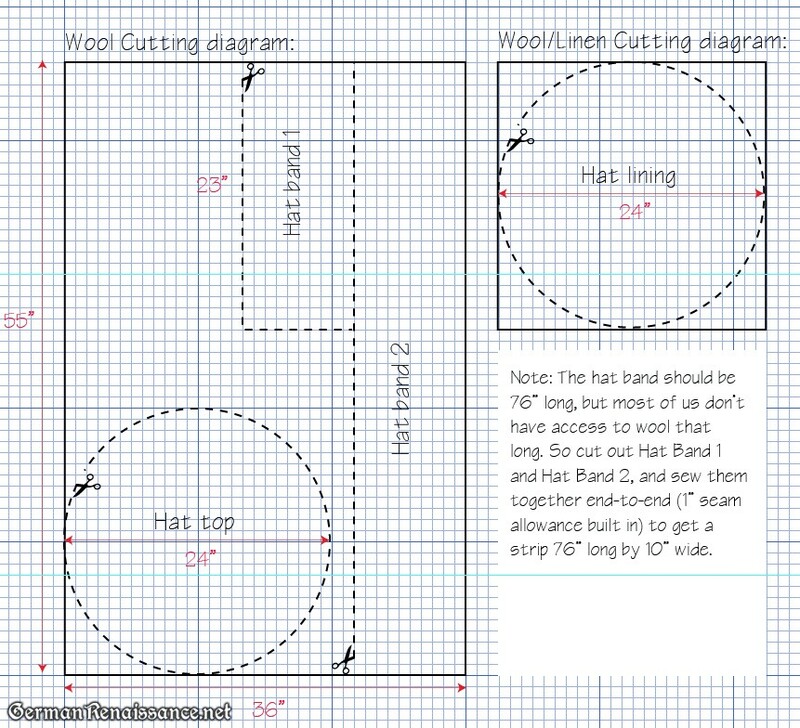 Cut out a 10″ x 76″ strip of wool (you’ll probably need to piece two strips together to get it this long — just make sure you are left with a square of wool at least 24″ x 24″ for the top of your hat. 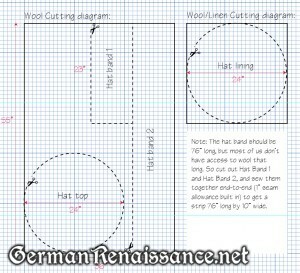 Below is a cutting diagram for your yard of wool to help you visualize what I mean). 2. Sew a 1/2″ casing — with a strong braid or cord inside it — along one edge of your wool strip. Leave the ends of the braid or cord hanging out either end of the casing. If you do not have time to make this strip with the casing and cord, don’t fret — it can be done during the class. Just keep in mind you may not be able to completely finish the hat during class if the hat band is not ready to go. Any questions, comments, or concerns before or after the class, please contact me at genoveva (dot) von [dot) lubeck (at) gmail [dot] com.